It’s a Madhouse, a Madhouse! Come on, John. Chew, chew, chew!… See, if you chew, your jaw muscles, they get tired, see? And then the other muscles, they get the message, and they get tired too, see? And before you know it, you’re sleeping. And, when we’re asleep, nobody can tell a sane man from an insane man, huh? Maybe it was the shootings in Tucson, maybe it was a hangover from the emotional overload of the holidays, but since the year turned, I haven’t been interested in reality so much as how it can become folded upon itself, how the mind can become dislocated. I’m not equipped to be able to determine whether the accused Arizona gunman, Jared Loughner, is sane or insane, or if his version of the world is wildly different than my own. In viewing the videos he apparently uploaded to YouTube, one’s struck by the repetition of odd words and phrases in a language that is similar to our own, but lacking a shared context. It’s as if his mind became a stuck record, skipping time and again. The old saying about the mentally ill is that they never realize it’s happening to them. They have no barometer for it. If your reality begins to diverge from the norm, how would you ever know? And would you listen to those who tried to tell you otherwise, or would you be convinced that you were the only righteous person in a world gone off its axis? What if it turned out to be true, that you were, in fact, the last sane man in the world? Just a bunch of wild and crazy guys…. To me, that’s the conceit of the celebrated One Flew Over the Cuckoo’s Nest (1975), which I watched in its entirety (twice, In fact) for likely the first time in 20 years. And while I was struck by the force of the acting, I never escaped the feeling that an allegory was being shoved down my throat. I never read Ken Kesey’s novel, but he was reportedly unhappy with what director Milos Forman and star Jack Nicholson (along with producer Michael Douglas) did with his material. In Cuckoo’s Nest, mental illness mainly seems to be a condition that can be overcome through the force of sheer braggadocio. Nicholson’s McMurphy is the only man who can stand up to the tyrannical Nurse Ratched (Louise Fletcher)—and the entire movie is a test of wills between McMurphy (the individual) and Ratched (the state). It seems like no coincidence that Cuckoo’s Nest found its resonance in the post-Watergate era, when public trust of the U.S. government was as its lowest ebb in modern times. Read that way, McMurphy, in spite of his venality, is the last honest man in a dishonest time, and his illness is nothing more than his nonconformity. The film doesn’t concern itself with the subjectivity of perception. Billy Bibbitt loses his virginity and the next morning, no longer stutters. His external actions have improved him, with this mind going along for the ride. What kind of film would it had been if Billy had strangled the prostitute he was with? McMurphy would no longer be a hero; he’d be a megalomaniac who manipulated and underestimated the suffering of his fellow patients. 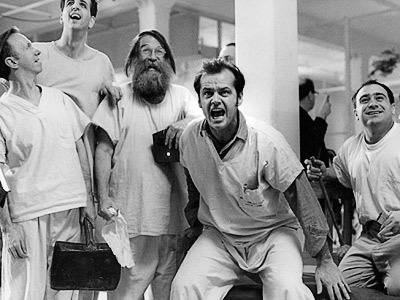 Such an ending, however, is unimaginable given Cuckoo’s Nest political context. Shock Corridor (1963), directed by the legendary Samuel Fuller, wants to have it both ways. At its base, it, too, is an allegory—the story of one man, Johnny Barrett (Peter Breck), who believes he can stay sane while committed to an asylum. There, he is, ironically, confronted with the true monstrous nature of mankind—war, racism, nuclear annihilation—and is driven over the edge. But unlike Forman in Cuckoo’s Nest, Fuller becomes less interested in reality. Instead, the story becomes driven by Barrett’s changing perception of his world. He begins to believe the cover story that his girlfriend (Constance Towers) is his sister, and in the movie’s famous climax, Barrett climbs the walls of the asylum, convinced he’s being buffeted by a thunderstorm. Never look directly at the nymphos. 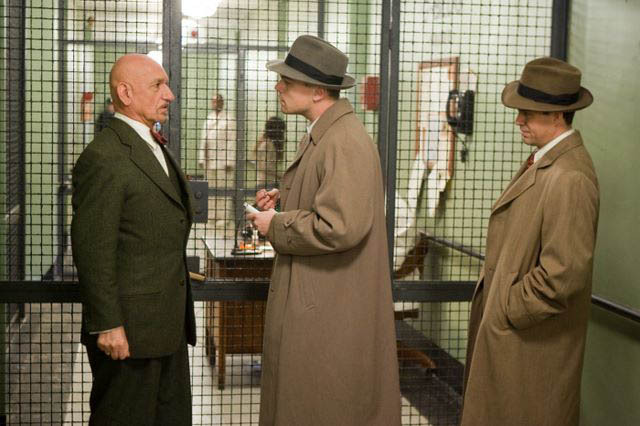 Martin Scorsese’s Shutter Island (2010) (spoilers ahoy) takes it one step further. This is another film that wants to have it both ways, but what Scorsese is really doing is fiddling with our subjective point of view from the very start. The film virtually telegraphs that nothing is as it seems, which, unfortunately for me, made it soon turn ponderous. To paraphrase Dennis Green: It was what I thought it was. The big reveal at the end was nothing of the kind. Part of the problem stems from Scorsese’s trademark intensity: his reality typically is so feverish–picture the final act of Goodfellas (1990) or almost all of Taxi Driver (1976)–that Shutter Island doesn’t feel as lurid or sensual as it should, it comes of almost as by-the-numbers. The nightmare into which Leonardo DiCaprio (as federal marshal Teddy Daniels) seemingly descends doesn’t stand out. Scorsese’s crazy almost feels mundane. Shutter Island basically inverts the dynamic set up by Cuckoo’s Nest: The oppressors of that 1970s film, the staff of the asylum, are now the benign helpers (the film is set in the 1950s, which may make it a metaphor for either the threat of Communism or Joe McCarthy; I can never get that straight), with the leading man, DiCaprio, absolutely not pulling a McMurphy-style fakeout. So what does it say when Nicholson’s character and DiCaprio’s character share the exact same fate, except one comes by it by free will and one comes by it because he dared to be free? (There is a difference.) I don’t know. Is that irony? Changing times? As you can see from our hats, we’re with the government. 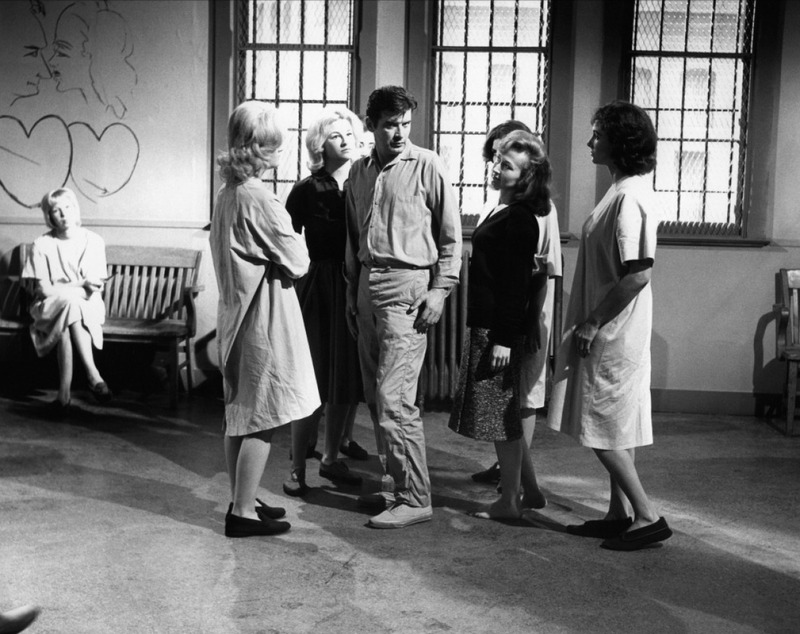 As it stands, all three–Cuckoo’s Nest, Shock Corridor and Shutter Island–end up with their protagonists as basket cases, victims of the institution. That may define the genre. Boxing pictures are about redemption. Prison movies are about freedom. Asylum films are about—I guess—the consequences of allowing the state to decide what’s real and unreal, or what’s acceptable and what’s disruptive. Then there’s Inception (2010), which requires a shoehorn here because it’s not an asylum movie. It’s very rare for me to see a movie and not know how to feel about it. 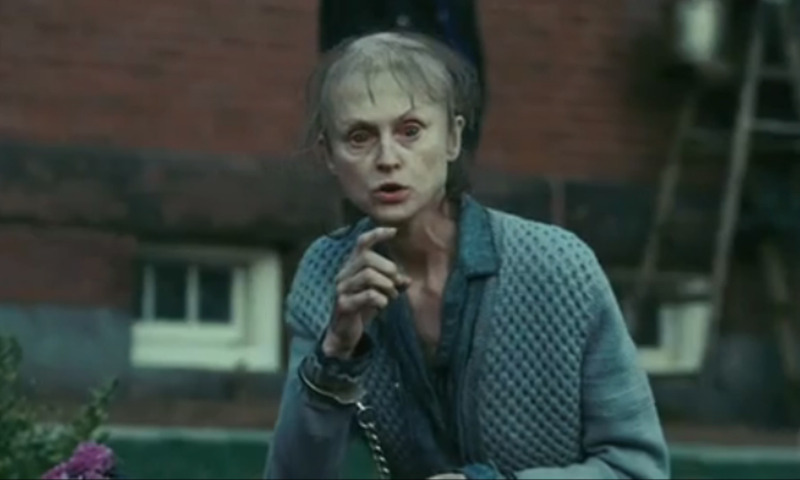 For instance, with Shutter Island, a sense of despair overtook me early and stayed on, straight and true, until it was over. By contrast, I respected Cuckoo’s Nest and Shock Corridor throughout, and my admiration for both has grown since. 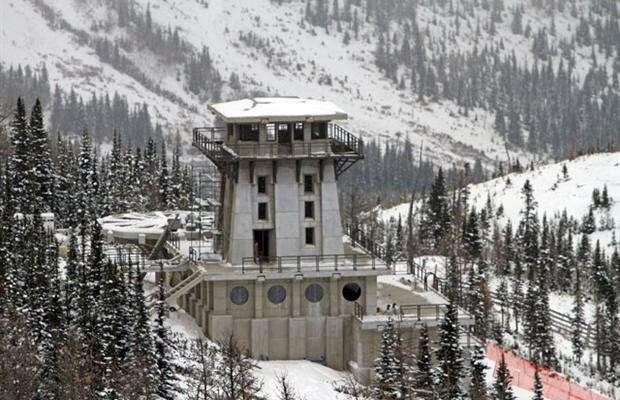 Not a shot from On Her Majesty’s Secret Service. But Inception—I think I’d like to dismiss it. In fact, that’s what I did. First, I wanted to love it—because of the plot. The subjective bending of reality. Of time. Of life and death. Hey, that’s up my alley. Then, in the middle of it, especially when the James Bondian sequence involving the snow fortress showed up, I decided to hate it, to declare there and then that the fanboys on the web had no idea what they were talking about in praising this derivative mess. And then the “is he really dreaming” ending. Ugh. IT WAS ALL A DREAM, screams on corner of the blogoverse. THE TOP WAS WOBBLING, screams the other. Okay, explain this to me again…What’s a totem? But the bottom line is this: I am softening on Inception. And I probably will see it again soon. It might be the first film I buy on Blu-Ray when I get a player. (I did this when I bought a DVD player; I bought The Matrix, which, of course, I haven’t watched since.) I guess, because it tried to be about something, I tried to be a summer blockbuster that forced people to debate the film at the coffee shop or the bar afterward. I can support that. I have defended Magnolia (1999), for instance, against all comers. Frogs be damned. I think that was probably Chris Nolan’s hope: That you never would get them. That makes Inception valuable fodder for Internet debate. It doesn’t mean it’s a good movie. On second thought, I take that back. Johnny Barrett, insane and mute, still won the Pulitzer Prize. It’s all downhill after you win anyway, Johnny. That’s what I hear. You did yourself a favor. This entry was posted in From the Queue, I Loathe This Movie Unreasonably, The Treatment by James Oliphant. Bookmark the permalink.